Affirmation Journal - Day 4 of Positive Self-Talk Challenge - Minette Riordan, Ph.D.
All week I have been talking about the importance of positive self-talk to help us improve our lives and our businesses. I issued a challenge on Monday to spend 7 days focusing on positive self-talk. Being nice to yourself is a practice and a journey. You have to cultivate the habit, especially if you have a history of constantly belittling, demeaning or beating yourself up about everything from your body to your business. Today I want to share a super fun, creative way to cultivate an ongoing self-talk habit using I am statements. I found this idea on one of my favorite craft blogs, Createmixedmedia.com by an awesome artist Nichole Rae. Nichole Rae writes: “I have been practicing my daily journaling for five months now. I am beginning to settle into this time allowing my spirit to unfold into the process of creating. Next to me sits my journal, black pens, a cup of coffee and my daily planner. I have always loved using a planner though having a entire week in front of me can be overwhelming at times. I have been adding personal affirmations to my art journaling. Having a love for creating daily, I wanted to utilize my planner in a creative way and explore new journaling possibilities. I also wanted to find a way for me to connect with the weekly tasks in my planner, easing the anxious feelings that arise. The beauty of this project is that it is small and does not take too much time, allowing you to be creative and still have time to accomplish your daily to-do list. For this month’s project I chose to create daily affirmations using the “I Am” writing prompt in a small weekly planner. I love this idea of creating a daily affirmation journal and you can see Nichole Rae’s beautiful example in the image at the top of the post. For the rest of the article, great photos and more instructions on how to create your own affirmation journal, read her complete post on CreateMixedMedia.com. 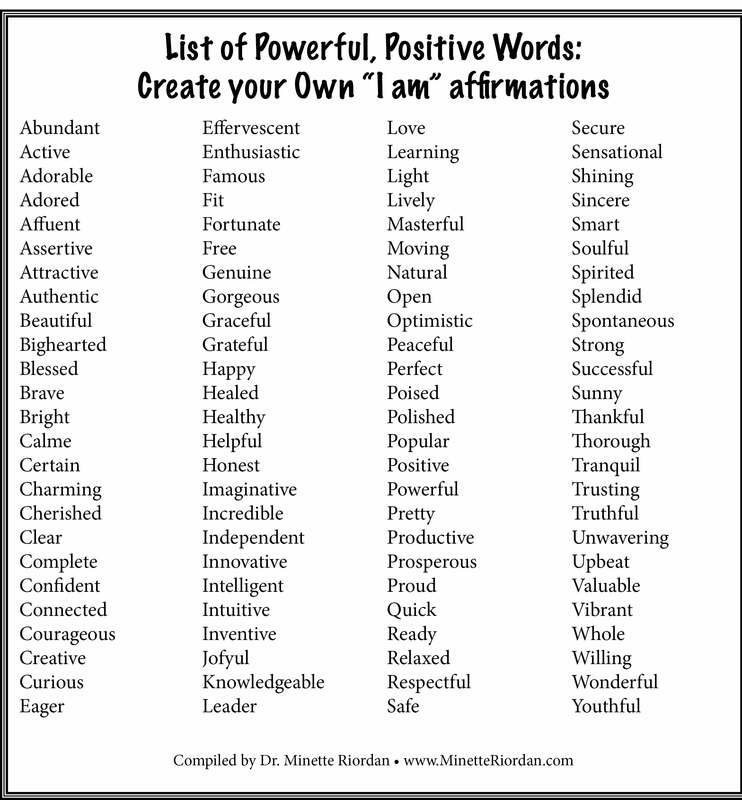 To help you write your I am statements, in case you are feeling stuck or finding it a challenge to think of anything positive, here is a list of powerful, positive words. Pick one that you want to embrace or randomly select a different one each day for your journal. Happy journaling. Share your favorite “I am” statement in the comments section below. I have been practicing my daily journaling for five months now. I am beginning to settle into this time allowing my spirit to unfold into the process of creating. First, start with the planner you have chosen to be your “journal” that you will use to create your I Am affirmations in. I chose to use a small planner that I would just have for my affirmations though you can use your daily planner that you keep your calendar in as well. Love the creativity of this. Such scrumptious ideas of how to shift your self-talk. Have been on the lookout for your posts this week, Minette, but somehow, every time I would scroll down, they just kept getting lost. A journal with all sorts of affirmative goodies about oneself is a wonderful project. I love your list of positive words. Can you imagine how young women would feel about themselves, if teachers gave them daily assignments to use these words about themselves in sentences! A win win – both language and self-esteem. Amen to that Judy, would love ALL children to feel loved, supported and confident and help them understand how that it all starts with loving themselves.